Visits by the clergy and other members help both congregations find common ground during Passover. 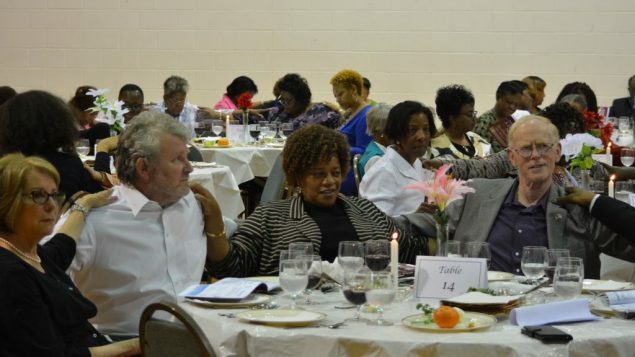 For the second Passover seder, Temple Emanu-El hosted clergy from Greater Piney Grove Baptist Church, a 5,000-member congregation in Atlanta’s Old 4th Ward. 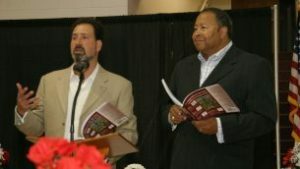 My husband, Rabbi Spike Anderson, and I were eager to reach out beyond Sandy Springs. Our new friends were curious and interested in learning about Jewish traditions and were willing to drive to the suburbs to be with us for seder. The senior pastor, the Rev. William Flippin, and his son, Richard, also a pastor at the church, sat with Emanu-El congregants, chatting about everything from theology to the ever-changing landscape of Atlanta. Although the Flippins have been to Israel several times, they had never been to a Passover seder and were delighted to join us. Our lay leaders gave the church group a tour of the sanctuary and answered questions about Jewish life. Many of Temple Emanu-El’s board members fought after-work traffic, exacerbated by the recent highway collapse, to make it to the church. 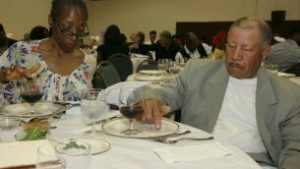 Everyone agreed it was worth it.This was just a warm-up, as Piney Grove was getting ready for its first Passover seder, a sold-out event with 175 people. Two days later, Spike and I took MARTA to East Atlanta with our three kids and a roller suitcase full of haggadahs. We were greeted at the church by several ministers, fussing over the last-minute details of a beautifully set-up dining room, a seder plate with all the ritual objects, including homemade charoset, on each table and red grape juice in every cup. Pastor Flippin’s table had a fine seder plate he had recently purchased in Israel, as well as candles from Tzfat that I couldn’t find in Atlanta for my own home a few days before. Also displayed was an impressive shofar that my oldest son got to blow, to the amusement of everyone. According to Baptist custom, I was referred to as first lady, which made my children giggle. First Lady Flippin showed my 5-year-old daughter her favorite part of the church, the sewing and reaping room, where older women make quilts and beginners make pillows and skirts. My daughter was soon sitting with women she had just met and playing games that involved a lot of tickles and hugs. Most touching was that the conversation at my table was devoid of bitterness. Instead, the church elders at my table talked about love, the kind of love Jews understand as chesed, or compassionate lovingkindness. They showed my family and me acceptance and love that were wholly unpretentious.While Spike led the seder and explained its rituals, Pastor Flippin retold the Exodus story, showing a depth of knowledge and preparation. It was especially meaningful to hear the story of the Israelites’ escape from slavery and their redemption from the perspective of a spiritual leader in the African-American community, whose recent history is still filled with pain. The room filled with song as we all raised our hands, uninhibited by differences and brought together in humanity.